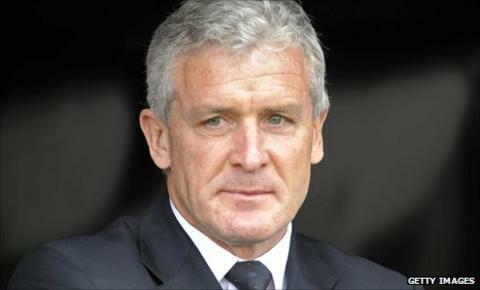 Former Sunderland defender Michael Gray believes chairman Ellis Short should move for Mark Hughes as replacement for sacked Steve Bruce. Gray played under Hughes for four years at Blackburn Rovers and believes he would be the perfect candidate to take over from Bruce, who left the Stadium of Light on Wednesday. Hughes is available after leaving Fulham at the end of last season and Gray says he has the edge on former Aston Villa manager Martin O'Neill, who has emerged as the other top candidate for the job. Gray told BBC Sport: "I played under Mark Hughes at Ewood Park and I loved it. I know exactly how he works and I think he would be perfect for what Sunderland need right now. "He is a personality of real stature and has a fine coaching staff, who he takes everywhere with him. He is out on the training ground every single day and knows exactly what he wants from his players. "Mark is astute tactically, a very hard-working manager and he gets the very best out of his squad, which is exactly what Sunderland need. Sunderland need results quickly and Mark would work those players like they have never been worked before. "He would hit the ground running because that is the way he works. We finished sixth in the Premier League under him at Blackburn and a large part of this was because he had us so well prepared and so fit. "In the last 15 minutes we used to overpower teams and we didn't fear anyone." Gray also had a brief spell under O'Neill at Celtic - and would put him as second choice on his wish list. He said: "Again Martin is a very good manager and his record is there for people, but if I had to pick a first choice it would be Mark Hughes." Gray expressed sympathy for the departing Bruce but said: "Everyone says how football is a results business. Sunderland's results recently haven't been good enough and Steve would be the first to admit that. "There is always a time that a manager needs to be changed, and even though Steve is a very good manager that time is probably right for Sunderland now."